3 The Swedish language is the national language. Five other languages are officially recognized as minority languages. 4 Population in the country, counties and municipalities on 31/12/2006 and Population Change in 2006. Statistiska centralbyrån. Retrieved on 2007-04-21. 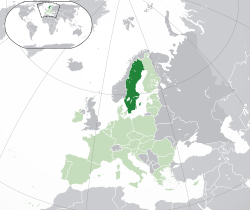 Suwidan (Tok Suwidan: Sverige, ~”sverye”, Tok Inglish: Sweden) em i wanpela kantri long Not Yurop. Stockholm i mo bikpela taun, na kapitol bilong Suwidan. Göteborg na Malmö i ol narapela bikpela taun. Tokples bilong Suwidan i Tok Suwidan. Tok Suwidan i tok Germanic bilong Not. Pat bilong Suwidan long taim Pinlan long Suwidan. This page was last edited on 5 Mas 2019, at 18:37.